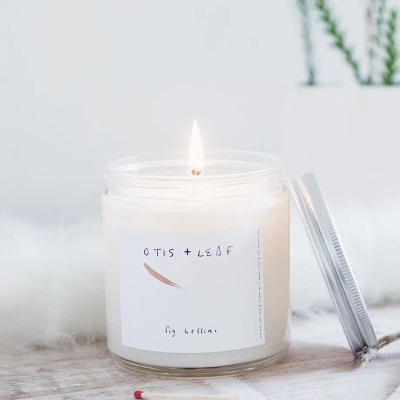 Fig Bellini Candle - Otis & Leaf - Candle Find ... the site for candle lovers! Fig Bellini marks the last candle in the trio I received from Otis & Leaf and boy did this candle smell good. The wax up close smelled fruity and earthy but I also smelled a hint of spice that intrigued me. With Fall officially in the air, I thought it was a perfect scent to burn. A fresh sweet blend of fig and current swilling in the air! Mmmmmm. Currant? Interesting and one I didn’t pick up on when I first smelled the wax. Currant is usually crisp and zesty but this fragrance had a spicy note to it. At least that’s what my nose picked up on. We shall see what comes to life once the candle is burning. Which happens right now! I lit my Fig Bellini candle in a small room to start out and that’s where it stayed till the very end. It didn’t take long for the aroma to start moving through the room and oh my goodness, my guest bathroom and the entire hallway outside it was filled with the aroma from this candle. The current really comes to life once the candle was burning and becomes the predominant element in this scent. Next comes the fig and there was something about it that kept me going back to smell it. 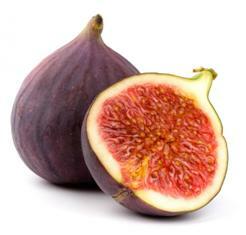 The fig (I swear) had a little earthy spice tied to it. It smelled sweet, earthy and spicy all at once. Blended with the zesty currant really created a unique aroma. I enjoyed this fragrance immensely. Strength – this little candle surprised me. I burned it in a small room but could easily have gotten away with burning it in a medium size room. It would have held it’s own for sure. On a scale of 1 to 10, I would rate this candle a 10 in a small room. 7 in a medium. That’s really good for this size candle. My Fig Bellini candle burned perfect. Zero wick issues. Clean burning from beginning to end. I barely even had to trim the wick throughout the life of the candle. Fig Bellini was a great candle and one I really enjoyed. It had a lot going on – the currant gave it a fresh zing and the fig an earthy and sweet spice. Blended together created a very unique aroma. I highly recommend this one. Now that I’ve burned all three fragrances from Otis & Leaf, Fig Bellini was by far my favorite of the three and would totally purchase this one again, but next time in their larger size.